1st Gear: What's The Deal With Ray DeGiorgio? Let's assume for the moment that GM isn't evil. That the people there didn't callously let people die. How do we explain what happened? Human error? Systematic issues? Maybe both? We've written a lot about this GM recall, and that's because so many people died and we still have so few answers. 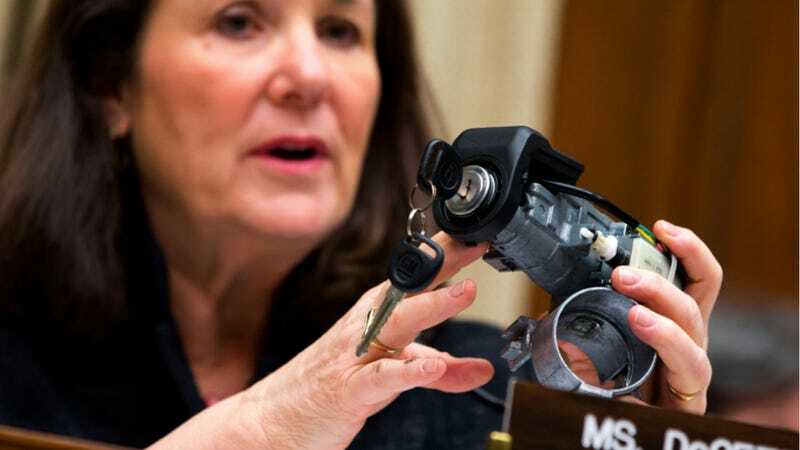 Yesterday, Raymond DeGiorgio, the engineer who signed off on a change to the ignition switch at the center of all of this, spoke to Congressional investigators. The New York Times has some information from that long session and it's worth reading. "He came across as if he was just overburdened and just missed it," said the staff member, who was not authorized to speak publicly about the investigation. Mr. DeGiorgio's comments, during 10 hours of questioning on May 19, offer a glimpse into how the switch was secretly changed eight years ago, but no recall was issued for vehicles equipped with the defective switches until this February. Mr. DeGiorgio did not give any information that indicated that the new chief executive of G.M., Mary T. Barra, knew anything about the problem before she took her job early this year. He did not seek to implicate any of his superiors, the people familiar with the questioning said. He also went on to say that he didn't knowingly lie in testimony about the switch recall in a former case, but simply forgot he'd signed off on the change to strengthen the part. I don't know who is telling the truth here, or what the truth is, which is why this story will persist. But I'm open to the possibility that GM was tragically ill prepared to deal with issues, that communication within the automaker was poor, and that one person was responsible for so many important decisions over the course of his career and that, rather than being part of a conspiracy to cover up those decisions, he simply didn't remember. It's a different and less interesting picture, of course, but it's a possibility we need to consider. 2nd Gear: Honda Accord Hybrid Not As Efficient As Promised? Consumer Reports has this trick where they go out and buy hybrids, test them, and determine that the promised mileage doesn't quite match up to the real mileage. They've done it with the Ford hybrids and now they're sticking it to the Accord. But the magazine's testers caution that Accord hybrid "buyers expecting their car to get the Environmental Protection Agency's figure of 47 m.p.g. might be disappointed. We've found that the EPA tests often exaggerate the fuel-economy of hybrids," said Jake Fisher, director of automotive testing at Consumer Reports. None of this is surprising, as the EPA test is fairly generous and it's often in the hands of automakers to self-test and report — which has led to some notorious problems. Still, newer cars are more efficient than the ones they replace, even if you have to have a pretty easy commute to hit numbers in the high 40s. I drove a Accord Hybrid and didn't mind it. Electric cars and plug-in hybrids are expected to be popular in China as the government pushes people into the cars, which is why it's no surprise BMW is investing money into seeing up 50 charging stations with Shanghai's electric company. Speaking at an event in Shanghai on Wednesday, Karsten Engel, chief executive for BMW's China operation, said BMW would sell a maximum of 1,000 i3 and i8 cars in the country this year. BMW i series will go on sale in China in September, but sales will be limited to around a dozen dealers in four cities due to a supply shortage and concerns over insufficient charging infrastructure. I have this feeling that's a problem that'll get resolved. Auto-braking systems that sense when you're about to crash and either slow or, at least, significantly reduce your speed are apparently getting better according to an IIHS report. Of the 24 vehicles tested, 21 were considered way above average. "We know that this technology is helping drivers avoid crashes," Zuby said. "The advantage of autobrake is that even in cases where a crash can't be avoided entirely, the system will reduce speed. Reducing the speed reduces the amount of damage that occurs to both the striking and struck cars, and reduces injuries to people in those cars." Automakers are resisting any calls to make this technology mandatory, but it'll eventually get cheap enough that many cars will have them. The Porsche Macan is barely on the market and Reuters is reporting that they're already looking into 2,500 models to check to see if some brake booster units may have been damaged during the assembly. 1. Reuters called the Macans "off-road vehicles," which is hilarious. 2. This is the second major Porsche production issue (see flaming cars) as they go from being a small producer of cars to a mass volume luxury sports brand. Neutral: Do You Expect To Get EPA Mileage? Or do you automatically discount it?